• Presence and Light Level Sensor. • Super sensitive - dual pyro element detection. • Easy mounting in luminaire or housing. • Designed to be used on LED loads. • Compact and discreet form factor. • Set-up using an IR programming handset. • Mode Lighting products are guaranteed for two years. 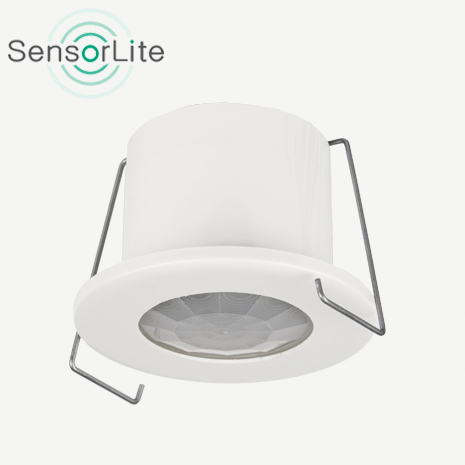 The SET-SEN-DIM-LM-P is a Presence detector for recessed mounting into luminaires. The SET-SEN-DIM-LM-P is a true stand alone multi-sensor, mains powered with occupancy and light level sensors designed to automatically switch lighting on when movement from body heat has been detected. Whilst the lights are ON the sensor can maintain a set lux level, dimming the LED fittings according to the incoming natural daylight. This maintained luminance function maximises energy savings. Once movement has ceased and after an adjustable time delay the sensor will automatically switch the lights OFF. As standard all SET-SEN-DIM sensors have the selectable option of DALI broadcast signal or 1-10V analogue output for dimming, all functions are adjusted through an IR handset.